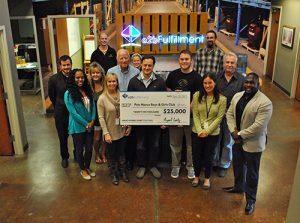 a2b Fulfillment is proud to join more than 200 civic-minded business leaders from across Georgia who pledge to goBeyondProfit and contribute corporate resources to meet community needs. goBeyondProfit is a unique concept inviting every business across Georgia to join but won’t ask pledge takers to divert time or money back to the initiative. Instead, goBeyondProfit provides a platform to align with other companies across the state to learn from one another and to shine a light on Georgia companies that invest time and corporate resources into the community and find their businesses strengthened by the endeavor. After launchng in December 2017, more than 200 companies across the state – ranging from Fortune 500 corporations to small, family owned businesses – have pledged to participate in this important effort in their cities and towns, inspiring others to follow suit. goBeyondProfit celebrates corporate generosity of all kinds and shares the stories of companies who meet community needs ranging from medical care to legal assistance, to educational programs, as well as workplace development skills and environmental efforts, mentoring, disaster relief, and more. a2b is included in the more than 200 pledge members found at www.gobeyondprofit.org/companies. While their business models and challenges range, they are aligned in their Pledge to find ways to positively affect society.